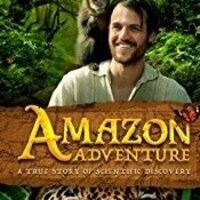 Amazon Adventure tells the epic, true story of explorer Henry Walter Bates, who risks his life for science in the 1850's as a young man during a fascinating 11 year journey through the visually stunning and biodiverse Amazon rainforest. Bates unearths compelling clues in his major discovery of the phenomenon of mimicry, whereby certain animals adopt the look of others that helps them deceive predators and gain an advantage to survive. Audiences will be wowed by the mind-boggling examples of camouflage and mimicry and inspired by Bates' endless curiosity and determination to explore the wilds of nature. While this documentary captures the true element that took place in the 1950s. It is necessary to come up with varied elements that appeal to the real sense of what took place. There are sources www.epoxydayton.com that depict different elements of the same. The piece above is just awesome. Thank you so much PA for inviting us to the event of Amazon Adventure it was an amazing experience for the entire team of www.jaipur4fun.com specially a young man during a fascinating 11 year journey through the visually stunning and biodiverse Amazon rainforest. Keep the awesome work up.